When I look back at 2018, it was a year that we invested everything, making life-or-death decisions to actualize True Parents’ teachings. As a result, it became a year of great challenge and victory to secure the heavenly world beyond the heavenly nation. It was really heavenly works (HW), not the power of human effort. You need to know that this is the result of True Father’s tearful devotion in Heaven, and True Mother’s work as the substantial Holy Spirit on earth and the only begotten daughter. There have been an increased number of trainees over the years because the Cheongpyeong Heaven and Earth Training Center is a place where people are reborn. From 95,000 people in 2015, to 125,000 people in 2016 and 175,000 people in 2017, we set a goal of 210,000 people in 2018. What’s the result? Last week’s statistics showed that 242,000 people had come. This number exceeded our goal by 115.2 percent. The providence of Branch Training Centers in four regions has begun. By 2020, we can fulfill the vision of having all the ancestor liberations and ancestor blessings completed up until 430 generations, if all the blessed families determine to do so. This is the special grace of True Parents. In the year 2018 True Parents supervised and we had remarkable victories by relentlessly challenging our goals. It’s been a year that Heavenly Parent and True Parents were victorious, and we all won. Let’s offer all the glory from all the victory to True Parents of Heaven, Earth and Humankind, especially to True Mother who is the only begotten daughter, the substantial Holy Spirit. True Mother has taught and shown us how to gain the victory. True Mother founded FFWPU for a Heavenly Korea (HK) and spoke the following words: “First, you should go with divine spirit and truth. Second, you should be one with Cheongpyeong. Third, you should be one with True Parents, because when you come together with True Parents, miracles are ready to happen. By praying and making sincere devotion, you will have enough spiritual foundation that your problems will automatically be resolved. Fourth, FFWPU headquarters for a HK should move to Hyojeong Cheonwon Cheongpyeong Holy Ground, divide into five regions, compete, and work five times harder.” She also ordered us to make the foundation for a 10,000-person rally by each region as soon as possible. Fifth, True Mother asked us to march forward quickly to accomplish these goals, so that on Feb. 22, 2018, the Resolution Rally for the Hopeful March Forward of FFWPU for a HK can be held at the CheongShim Peace World Center. All we have to do is to absolutely accept the True Parents’ teachings and push forward with them, because True Parents’ teachings are the way, the truth, the life, the Blessing, and have the power to recreate. True Mother also asked us to move forward under divine spirit and truth. 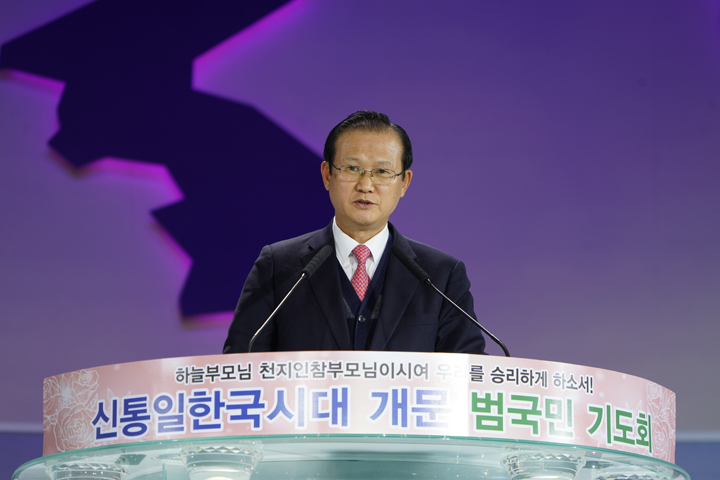 In order to be completely united with Cheongpyeong, all the Church leaders were educated about the Cheongpyeong Providence; then 127,880 people were able to participate in chanyang at local sites around Korea. More and more people are becoming involved with True Parents through the Jeongshim Won special prayer and are beginning to show their true abilities hidden within themselves. The prayer vigils (PVs) in the Jeongshim Won were an amazing blessing from heaven. True Mother directed eight people in charge of the providential institutes to do the PVs in the Jeongshim Won for 21 days starting March 8 (12 am~3 am). I received this message from heaven, so I prayed out loud saying, “Now eight people are praying, but when there are more than 80, or 800, and 8,000 people, there will be amazing HW for the Unification of our nation.” Over the past nine months since April, the PVs have been held over 115 times, and about 13,800 people have attended. More than twice as many people are gathered here for the PV today; I prayed for 8,000 people to attend last time. In order to connect with this sincere devotion, heaven set the conditions for the spirit world to work through the grace of the CIG Hyojeong Won and Hyojeong Offering Paper. As a result, we had an enormous victory, hosting 20,000 people from each Region, originally planned as 10,000 people each. A huge movement has arisen and many people have been able to proclaim their responsibility as heavenly tribal messiahs. We should proudly enter the CheonBo Won, which True Parents prepared for us. To do this, there must be works by our omniscient Heavenly Parent, True Parents, and the absolute good spirits. We have to show them how much we love True Parents. We also need to show how determined we are when we start. We are the ones who have to make the heavenly will come true in 2019. I believe that if we start with this determination, Heavenly Parent and True Parents will give us amazing blessings in 2019. Aju!